Which 2019 Toyota Corolla Is Right for You? The 2019 Toyota Corolla has a history of being incredibly reliable and affordable, according to U.S. News & World Report. It’s a compact sedan that can fit any budget. Even as a Toyota Corolla fan, all the different trims can be a little confusing. Thankfully, we’re here to break down each trim so you know what you want in your next car. The 2019 Toyota Corolla L trim has an incredible starting MSRP of just $18,700. It comes with a 1.8-liter, 4-cylinder engine that gets up to 28 mpg in the city and 36 mpg on the highway. The inside comes with basic features you’d expect in a 2019 car including a USB port, advanced voice recognition, hands-free phone abilities, and Bluetooth technology. It also comes with an integrated backup camera to make parking even easier. One of the best things Toyota includes with most of its vehicles is Toyota Safety Sense. This package comes with a Pre-Collision System that includes Pedestrian Detection, Lane Departure Alerts with Steering Assist, Automatic High Beams, and Dynamic Radar Cruise Control. The Toyota Corolla LE comes with the same engine and more features and a starting MSRP of $19,135. One of the best features of the LE is the multi-function in-key remote which allows keyless entry; lock, unlock, and panic functions; and trunk release. It also comes with automatic climate control, including a dust and pollen filter. This may be important for those who deal with bad allergies or asthma. The LE seems like a pretty great option, but if you’re concerned about the environment, you can get the LE Eco. This vehicle comes with all the same features but includes a better engine and more efficient emissions rating. This sedan comes with a 1.8-liter, 4-cylinder engine with a continuously variable transmission. The LE Eco can get up to 30 mpg in the city and 40 mpg on the highway all for under $20,000. The starting MSRP is $19,535. The 2019 Corolla XLE starts at $22,135. This trim has some great features that make your Corolla more fun to drive. One of the first things a driver may notice is the addition of a moonroof with power tilt and slide. Another change is Entune Audio Plus. There are also heated seats in the front of the car for the driver and the passenger. Finally, the XLE comes with a Smart Key System that allows Push-Button Start. The Toyota Corolla SE is a sporty option for those who are looking for a little more flair. It starts at $20,645 and has a slightly different exterior that includes a racing-inspired front fascia and rear spoiler. You may notice that the front air intakes on the sides of the grille are larger and more aggressively designed compared to other models. On the inside, the seats change from fabric to SofTex. This synthetic leather material is easy to clean and also resistant to liquids. Once you’re behind the wheel, you’ll notice two driving modes: normal and sport. The sport driving mode gives you increased acceleration and Electric Power Assist, which is designed to give you more control. Toyota also offers a hatchback version of the Corolla in the SE trim. With a starting MSRP of $19,990, the 2019 Toyota Corolla Hatchback SE has a liftgate that swings upward. This allows drivers to access the storage area just behind the rear seats instead of a trunk on the sedan model. The Corolla Hatchback SE also features a different engine from the sedan model. The 2.0-L dynamic force 4-cylinder engine can have either a manual or CVT transmission. The manual transmission, especially, fits at home with the more racing-inspired look on the hatchback SE model. Lastly, the 2019 Toyota Corolla XSE is the ultimate sporty option and starts at $22,880. In many ways, this trim is a combination of the XLE and SE. It comes with the sporty feel of the SE, including the SofTex synthetic leather, while also adding the advanced technological features of the XLE. Drivers will also find Entune Audio Plus with Connected Navigation, power-adjustable and heated seating, and the Smart Key System with Push Button Start. Toyota also offers a hatchback-style model at the XSE trim for an MSRP of $22,990. 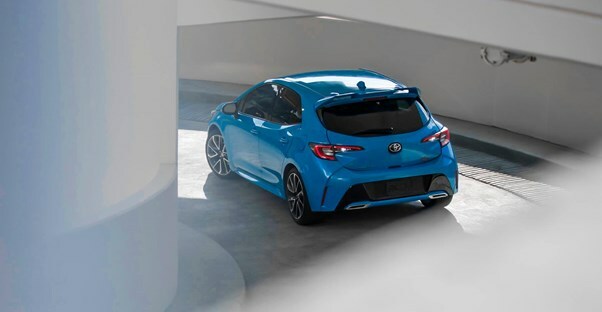 The 2019 Toyota Corolla Hatchback XSE features wheel-mounted paddle shifters to complete the sport styling of the vehicle. Also inside the cabin, drivers will find an 8-in touchscreen display as well as leather-trimmed heated sport seats. On the exterior, the Hatchback XSE rides atop 18-in machined alloy wheels, two inches larger than the Hatchback SE wheels. Which 2019 Chevrolet Equinox Is Right for You? Which 2019 Ford Fusion Is Right for You?